Our range of Edible food pens are filled with edible ink. The Pens have a standard pen style 2.5mm nib which can be used for standard work and a fine 0.5mm nib for the fine detail such as adding facial features and intricate details to sugar flowers. 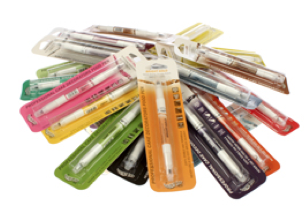 These quick drying Edible food pens, are suitable for vegetarians, Kosher, and Halal. Our Edible food pens are available in 23 vibrant colours, are quick drying and are unique against most other edible food pens as these pens are double sided. The opposite end of the pen has a 2.5 mm thicker nib is suitable for creating messages and pictures on icing. The Edible food pens are easy to use for the novice and professional cake decorator and are brilliant for children to use and get involved in cake decorating. They can be used on iced cookies and designs can be embossed onto sugar paste or flower paste using any shape cutter or detailed plastic embossers, leave to dry for at least 24 hours then your piece can be coloured in using the Edible food pens. I t’s probably fair to say that we have all experienced uneven layers of cake when somehow the knife doesn’t quite cut the cake as level as we thought it should. Following intensive research, a special intertwined wire that works in a similar way to a serrated knife was selected, creating a leveller that does a great job and is easy to use. 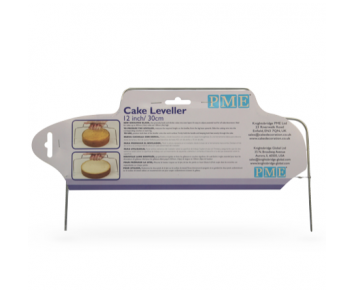 By using the 12″ Cake leveller you will be able to complete a perfectly level cut cake. Ideal for evenly layering out your wedding cakes and birthday cakes. We also sell the 18″ Cake leveller as well as the 12″ Cake Leveller. Both are available from our cake decorating shop, Solihull, West midlands or why not simply order from our online cake decorating shop. Our full range of JEM Cutters are now available and range includes Jem strip cutters, Jem numeral cutters, Jem banner cutters to Jem ladies shoe cutter, Jem 3D Yatch cutter and Arum Lily & Leaf Cutter to name just a few of these fabulous cake decorating cutters. JEM Cutters produce superior quality cake decorating accessories. We have a fanastic range of cutters from flowers & follage, sports & leisure, fashion, Christmas, plaques, Animals & wild life, borders and to cutters for creating beautiful but easy 3D sugar models. With our range of Jem Cutters we are sure you will be able to create the perfect cake decoration for any special occasion cake or wedding cake. Whether you are using Florist paste or modelling paste to create your decorations you will find using this range of cake decorating equipment easy. 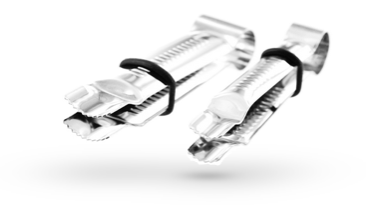 Crimpers are tools that can be likened to a pair of tweezers. They are designed to create many different decorative patterns on sugarpaste e.g. Heart, holly, bow, vee or curved, triple scallop etc. Available in two sizes, ½”(13mm) and ¾”(19mm), you can choose whether to have plain or serrated teeth, and open or closed design! Crimpers may be used in conjunction with other tools to create more intricate patterns if desired. Each crimper is complete with a rubber ‘O’ ring band, and the position of this will determine the width of the ‘crimp’. Hold the crimper with the teeth at the width chosen, and push into reasonably thick sugarpaste, to a depth of approx. 2-3 mm. Pinch the teeth together and carefully remove from paste keeping the width of the teeth the same. Continue the pattern. Take care not to push the crimper in too far, otherwise the cake may show through. Practice the technique on some leftover sugarpaste first. You will find it a very quick and easy way to apply a pattern to your paste. Various depths of paste and width of teeth will all give different results! You may need to leave the sugarpaste to firm up for 10 minutes or so before starting. While using dip the teeth into icing sugar or petal base to prevent sticking. With the festive season approaching we have a great selection of cupcake and Christmas cake decorations. 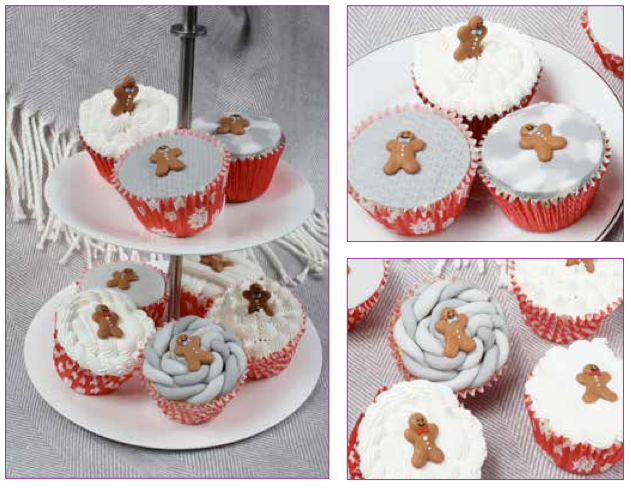 Try our easy to make cupcakes, perfect for a festive family gathering! and cooled, the cupcakes are ready to decorate. some of the cupcakes as shown in the picture. Top the buttercream with a gingerbread man sugar piping. using a small amount of buttercream to secure in place. Top with a gingerbread man sugar piping. colours in Pebble, Mist and White until the colours are marbled. circles big enough to cover the top of the cupcakes. and apply the marbled sugar paste circles. Again, finish with a gingerbread sugar piping. Loving Everything To Do With Christmas Cupcakes! With the football season already started, I thought I would share with you a quick and easy way to make a ‘football themed celebration cake’! In fact, it is so easy to make even the children can help! 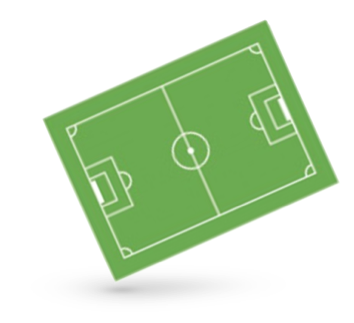 We have a fantastic new range of football themed edible and non edible cake decorations and a great range of football themed cake decorating equipment from football candles, players to edible wafer pitches, football shirt cutters, moulds and ribbon to help you create ultimate football cake or cupcake! Bake an oblong cake approximately 12”x 8” and cover with green M&B sugarpaste. If you don’t have the correct size tin then you can cut your cake to size. Dampen the top of your cake slightly and attach the Football wafer pitch. Once this is dry you can add your football figures and goal posts. For a really different wedding theme, why not design a football wedding cake and cupcakes! 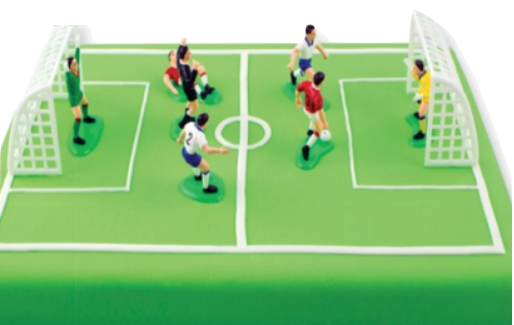 Or simply add our footballer cake toppers to your delicious cupcakes to create your very own football team! We always love new products and ideas and recently arrived in our cake decorating shop are the new range of pastel, primary and polka dot sugar bows. The bows really can add a special finish to a celebration cake or complete a gift box cake design. 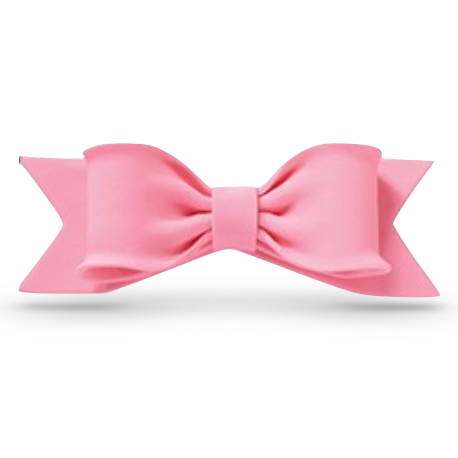 Our selection of sugar colour bows are ideal cake toppers for birthday cakes, Christmas cakes and celebration cakes. Each bow measures approx 150mm x 50mm. Remove the bow from the cake before serving. Our Sugar Flower Bows are available in various colours and designs from dots, pastel colours and primary colours to Christmas bows. One of our favourite wedding venues is the resplendent Nuthurst Grange in Hockley Heath, Solihull. This wedding venue suits all types of wedding cake designs and recently two of our wedding cakes looked stunning in the main reception room. We have been very busy creating fabulous wedding cakes through out the summer, which have most certainly been complemented by the wonderful wedding venues we are so lucky to be part of. There have been so many wonderful new wedding venues to mention, but one of our favourite is Combe Abbey, Coventry. No matter if the cake is a 3 tier, or a 6 tier wedding cake, this venue perfectly lends it self to small and large receptions. For wedding cake designers this is delightful, allowing us to design cakes perfect for the bride and groom and matching the back drop of the venue. The new peony flower cutters by Fmm have been very popular. These easy to use cutters create beautiful sugarflowers ideal for wedding cakes. 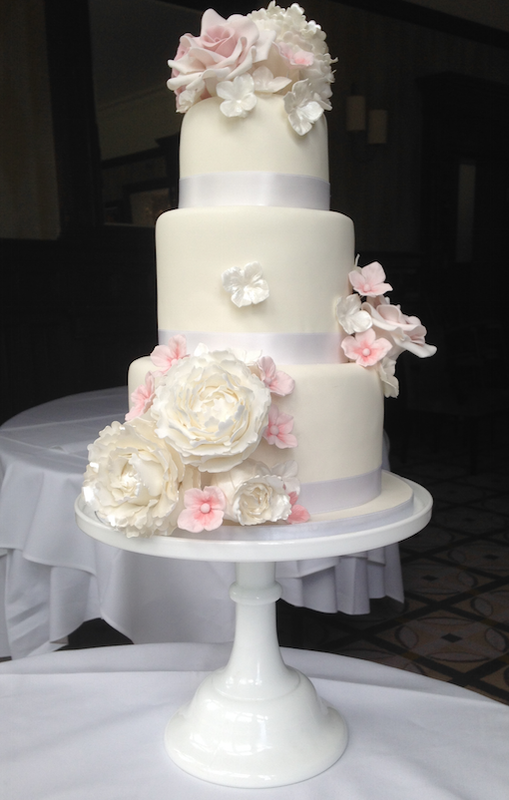 The wedding cake picture shows how stunning sugarflower roses look on a wedding cake. 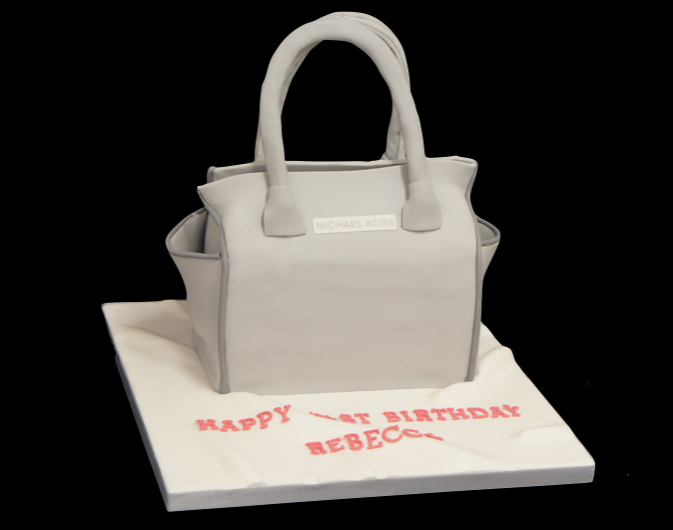 We always have great fun creating new celebration birthday cakes and a few newly added cakes to our collection are designer Michael Kors and Mulberry Bayswater handbag cakes. Our new spiral cakes have become a real talking point. The First spiral piano cake was designed and created by Arden. (Happy Birthday Arden) and our minion cakes are always fun to make! Some recently added products to our Cake Decorating,Cake Decorations And Cupcake Supplies online shop, are the excellent Fpc Sugarcraft moulds. There is an excellent range of different designed moulds cateering for all occasions and perfect for making edible and non edible cake and cupcake decorations. Loving Everything To Do With Cake Decorating, Cake Decorations And Cupcake Supplies! Creating stunning edible decorations is now even easier with with our new range of Ready-tempered Isomalt now available from our cake decorating,decorations and cupcake supplies shop. 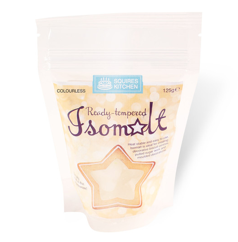 Isomalt is a sugar-free alternative that is ideal for making decorative biscuit centres, pulled sugar work and moulded decorations that you simply melt in a microwave. For decorative biscuit centres, simply cut the desired shape out of the centre of each biscuit, then bake in the oven as normal. Once fully baked, remove the biscuits from the oven, pour a small amount of melted isomalt into each centre and leave to cool. Our range of Isomalt comes in bright colours: Yellow, Orange, Red, Pink, Blue, Green and Purple, as well as Gold Sparkle and Silver Sparkle to add shimmer to your creations. Isomalt is a sugar substitute which is safe for the teeth and has 50% less calories than table sugar. Isomalt has a melting point of 145°C to 150°C and is pre-tempered so it can be easily melted in the microwave. When working with liquid Isomalt remember to take great care as it can cause serious burns. For this reason, Isomalt should not be used by children. Place the desired amount of isomalt blossoms into a microwaveable container that can withstand temperatures of over 180°C (e.g. a ceramic, silicone or heat-resistant glass bowl) and place in a microwave. Melt in 30-second increments until the isomalt becomes fluid. Make sure to check the isomalt after each increment and do not heat for longer than 30 seconds at a time. The isomalt will be extremely hot. Stir and wait for the bubbling to stop then slowly pour into the desired container or mould. Alternatively you can pour onto a heatproof flat surface and work it with kitchen utensils or, once cool enough, your hands. To make the surface smoother or to smooth any rough edges, sweep a crème brûlée torch over any isomalt that has touched the mould. For creating larger pieces, we recommend using our larger packs of SK Isomalt. Melt the isomalt as per the instructions and wait for the liquid to stop bubbling. Place the mould onto the baking tray and gently pour the solution into the mould. If more than one colour is required, pour one colour into part of the mould and allow to set. Pour the other colour in, ensuring that it completely attaches to the first colour. Leave until cold, then remove from mould. If the isomalt sets in the microwaveable container or a piece has not set as required, it can be re-melted and used again. Store smaller pieces in an airtight container with silica gel sachets. Follow the method as for silicone moulds for bringing the isomalt to temperature. Lightly grease the outside of a ladle. Allow a fine strand to fall off the end of a spoon and form a trellis or other lacy pattern over the back of the ladle. When completely set, carefully remove the sugar basket from the ladle. The basket can then be filled with ice cream or other dessert. Serve immediately as the basket will start to dissolve. The isomalt solution can also be piped, but great care needs to be taken when doing this. Use triple layers of silicone paper piping bags, do not overfill the bag, and ensure that the open ends of the bag are folded down so that the solution cannot spill out of the bag. Wear heavy-duty rubber gloves, a protective apron and covered shoes when doing this and as a safety precaution, wrap the piping bag in a tea towel before beginning to pipe. It is also possible to create spun sugar by quickly spinning a very fine strand of the liquid isomalt onto a lightly-greased baking tray. This can then be gathered up and placed on top of a dessert for a stunning effect. 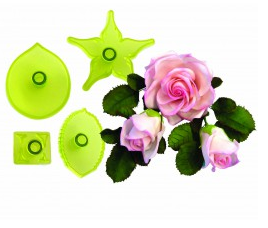 For inspiring ideas, there are many silicone moulds in the SK Great Impressions range which work well with Isomalt. The fairies look fantastic and the jewel mould makes excellent edible gems. Click here to see cake decorating moulds in our Great Cake Decorating section. Check out our new range of gravity celebration cakes. Loving Everything To Do With Cake decorations,Cake Decorating And Cupcake Supplies! We have just added our new cake decorating classes onto our website for 2015. 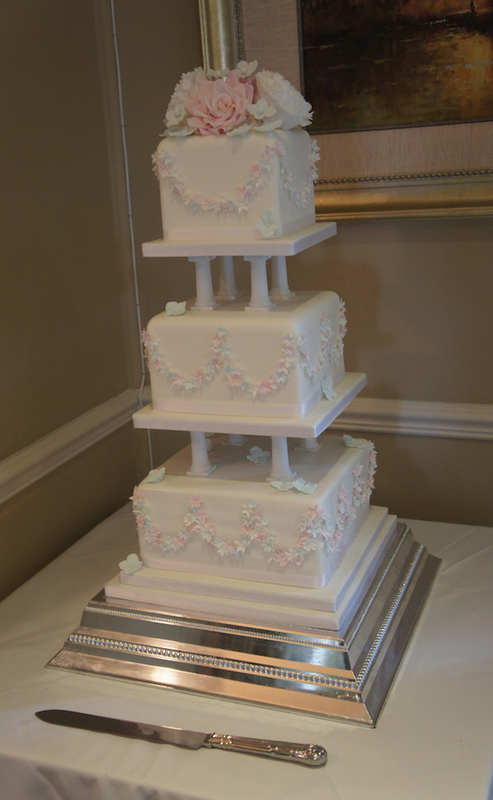 We will shortly be adding further dates for our popular 3 Tier Wedding Cake Course and modelling courses. Also new for 2015 we will be teaching 3 new novelty cake decorating courses, a children’s novelty cake decorating course, a novelty cake for her and a novelty cake for him class. We have added some fanastic new products onto our Sugarbliss Cake decorating Company supplies shop ideal for simply adding to a special Father’s Day Cake. Using an 8 inch round cake base cover the cake in green sugarpaste icing. Using brown sugar paste create some planks of wood and emboss with PME tree bark impression mat and cut to size. Make a TV using and tool box using some black Florist paste. Add a message onto the screen using an edible pen or using some royal icing. 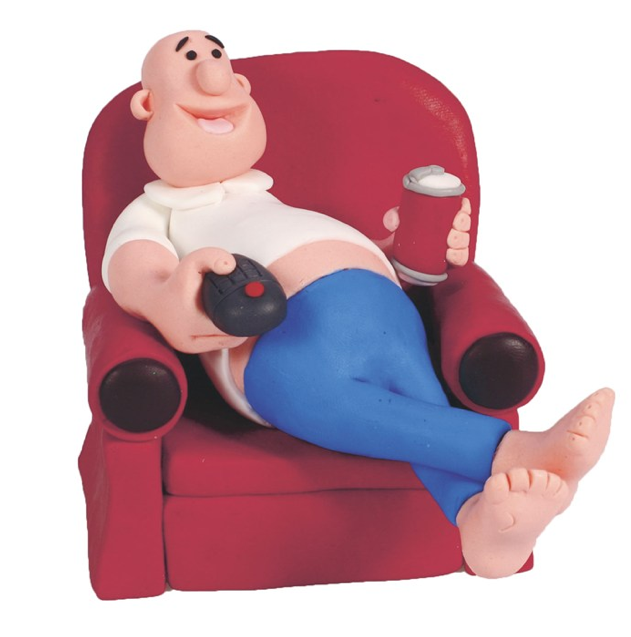 Place the claydough armchair on the cake and position the TV in front of man. Loving Everything To Do With Cake decorations, Cake Decorating And Cupcake Supplies!